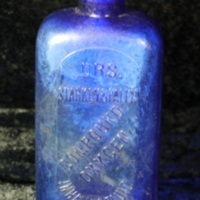 This rare bottle is embossed "MRS. J.H.R. 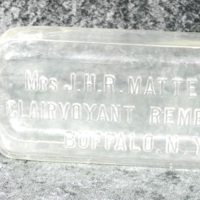 MATTESON./CLAIRVOYANT REMEDIES./BUFFALO, N.Y." Of clear glass, it was blown in a two-piece mold and its neck finished by hand. 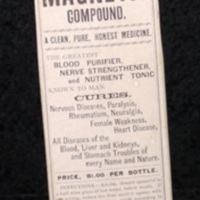 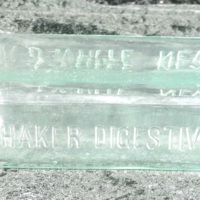 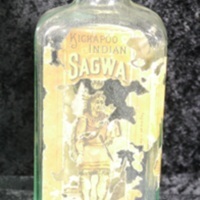 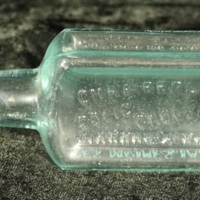 An example of a typical patent medicine, this bottle was blown in a hinged mold and has raised lettering. 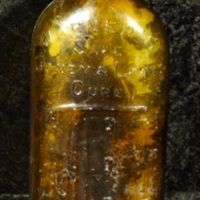 Advertising dates this bottle to 1905-1910. 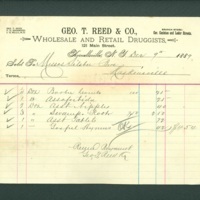 Druggists' billhead lists a variety of products commonly available in 1885, including (line two) "Swamp Root" which sold for 67 cents per bottle. 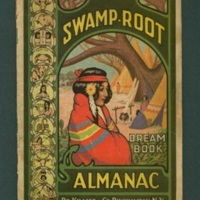 This advertising almanac contains a "Dream Book" - an alphabetical listing of dream interpretations - and daily horoscopes, weather forecasts, and astronomical data, including sunrises and moon phases. 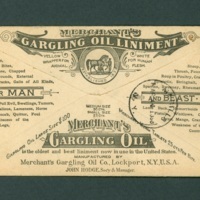 This envelope bears an advertisement for Merchant's Gargling Oil, manufactured for "man and beast" to cure a variety of ailments, including thrush, rheumatism, mange, and hemhorroids.